“Sweating for Two” shirt for our give-away next week! Did you enjoy the “Healthy Christmas Gifts” give-away partnership I ran shortly before Christmas (including those cute Under Armour running shoes)? Well, I have great news for you! I have partnered with several FitFluential ambassadors again, and we are brining you a series of give-aways next week to get you excited about working out in 2013! Most of the gifts will be for fit pregnancies, but stay tuned, because we will likely have a few gifts that you can use if you aren’t pregnant. Of course, you could also enter and give the fit pregnancy gifts to your friend who is pregnant. After all, us pregnant ladies like gifts too, and sometimes feel slighted when the only thing we receive for birthdays is baby clothes. The photo to the right is a little sneak peek of one of the shirts we will be giving away from For Two Fitness. So cute, right? I am currently sitting in the guest room with Emma early on a Sunday morning, and I can smell the Paleo pancakes my hubby is making for us downstairs. That’s right — Paleo pancakes! I have been hearing a ton from my FitFluential friends about the Paleo diet this year, and I decided to give it a try while Brandon is out-of-town for the next two weeks. Be sure to scroll to the bottom of this post to see the three ingredient recipe and a photo of the Paleo pancakes. Small filet, brocoli, and sweet potato for dinner on Friday night. I started researching Paleo on Friday, and ate a small filet, sweat potato, and brocoli for dinner. Yum! Yesterday, we had a LOT of eggs, bacon, veggies, fruits, and water. I felt really good all day — versus Friday where I felt bloated even though I was “trying” to stick to a wheat free diet. I think my body will respond well to removing dairy, and I’m very excited to see how I feel after two full weeks of Paleo. So, what is Paleo? Here is an ultimate guide that sums it up nicely. Three ingredient Paleo pancakes. Delicious! Mash the bananas in a bowl. Add the egg and almond butter. Mix until combined. I also opted to add a tough of cinnamon. Heat the frying pan on medium heat and use 1/4 cup measuring cup to pur each pancake. Once you start seeing bubbles on the pancakes, flip them. I topped them with a tiny bit of local honey, but they are great plain too. Delish! So great that you are trying out Paleo AND I love the guide you posted from Greatist! I sort of fell into Paleo because of food allergies and have been eating this way for about a year+. I feel great and the food is amazing! 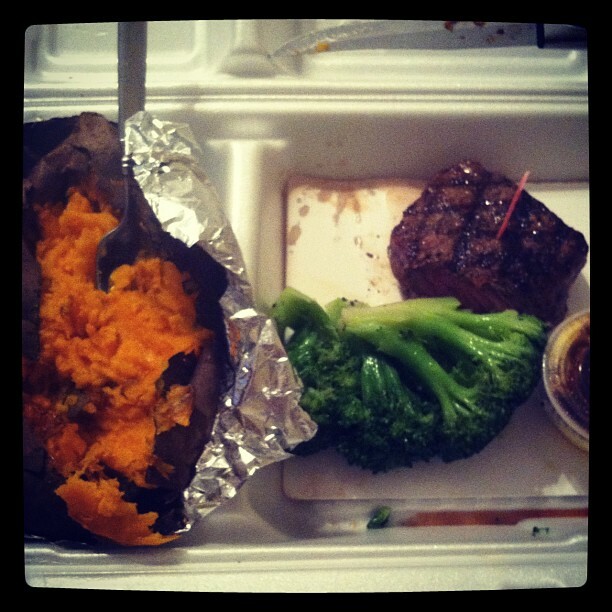 Your steak and sweet potato look delish btw. I’m going to pin these pancakes as I think they are approved on the 21 Day Sugar Detox (wahoo!). I can’t wait to see what else you come up with! Thanks girl! I’m so excited to try it! I don’t think it will be too hard of a transition for me because I was doing wheat free (for the most part). I already feel good after a couple days — no bloating, no overwhelming hunger, etc. Thanks for reading and I look forward to connecting further! 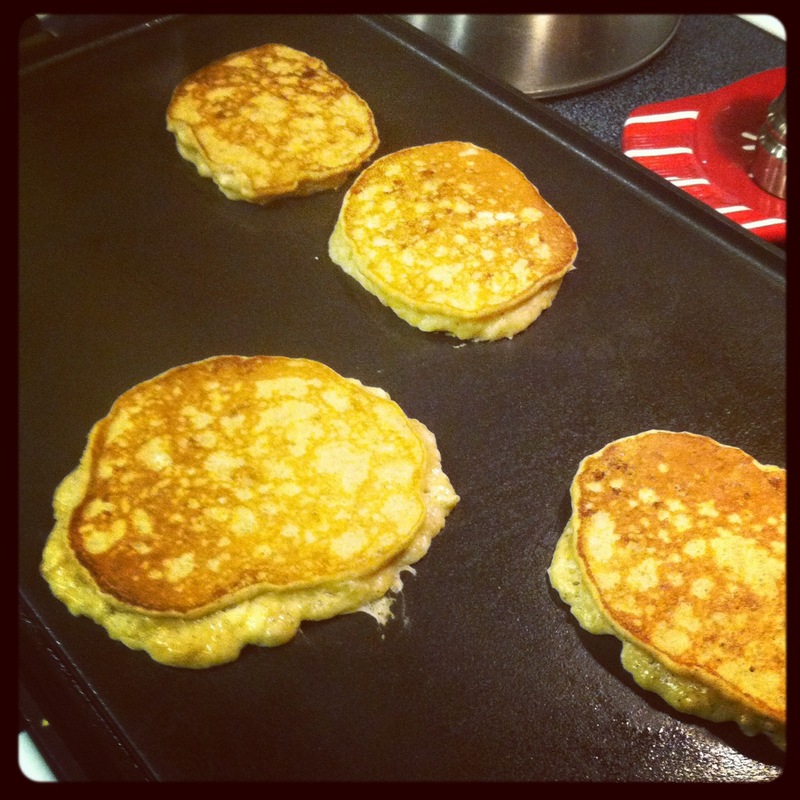 Love paleo pancakes! I looked into paleo at one point but am not in a place to actually do it right now! Maybe later this year!! I’ve seen some awesome results! Good luck girlfriend! One question, when I found this on Pininterest, it had a note to use green tipped bananas? Does this matter or can we use fully ripened ones? Great question Karen! You could leave them on the skillet for longer or even bake them on a cookie sheet in the oven. I have tried another Paleo pancake recipe that is even more “pancake like” and I LOVE the taste — but they are packed with cals. I will look it up and leave the link here soon!